We’ve asked physicians and practices. We’ve asked patients. So let’s round things out and ask executives what they think. 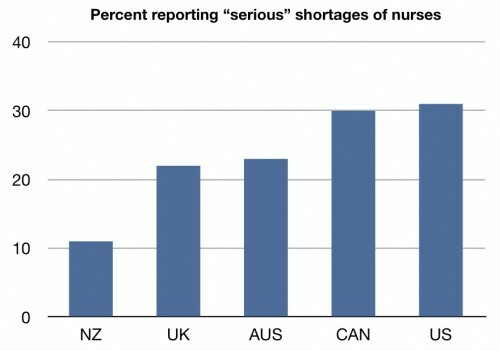 Telephone survey of hospital executives in Australia, Canada, New Zealand, United Kingdom, and the United States. Like the previous surveys I have discussed, this was a comparison across intentional systems, asking hospital executives for their thoughts. I’m not going to cover every question, but I am going to try to give you some things to think about with respect to the quality of the health care systems. Better. Again, this should be no surprise given the hard numbers we’ve seen before. Let’s move on to something new. 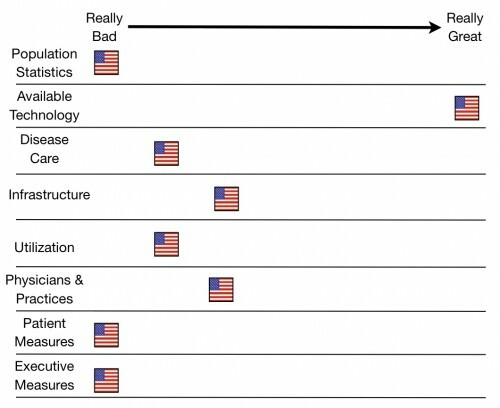 How do hospital executives think that government regulations or policies work to improve the quality of the health care system? What’s fascinating here is that hospital executives in countries that we think of having huge government intervention and oversight think that the regulations improve things. 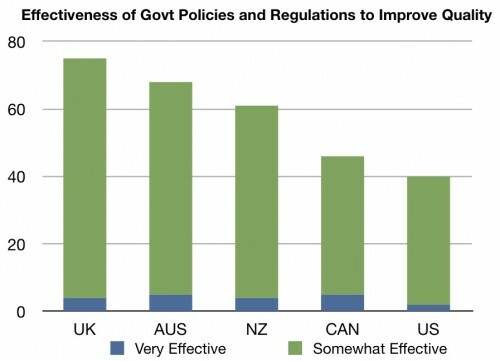 In the US, which has less in the way of policies and regulations, executives think they aren’t effective. Of course, I’m willing to bet that many of these same executives would argue that there is too much government in the US. We can get down to more specifics, though. How do hospital executives rate physician morale in various countries? Worse in the United States than in any of the other countries. And worse by a fair amount. 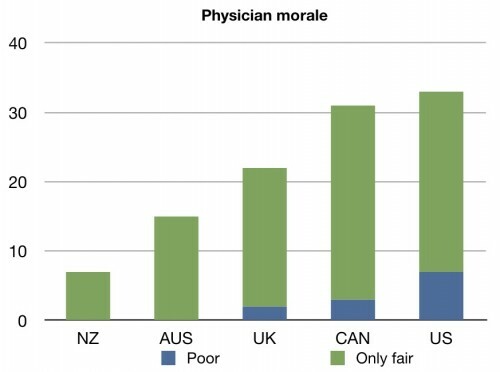 They think that about one in every three doctors in the US has “poor” or “fair” morale. Finally, how satisfied are hospital executives themselves with their respective health care systems? The difference isn’t subtle. 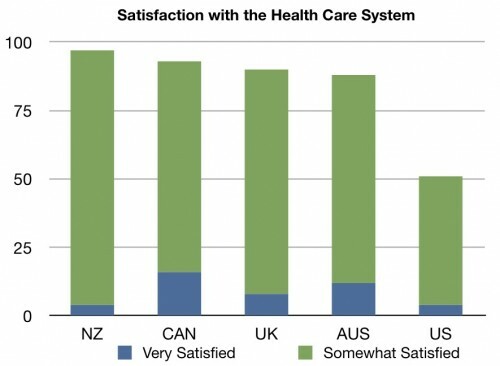 Just over half of hospital executives in the United States are “very satisfied” or “somewhat satisfied” with the health care system, compared to far more in other countries. There’s not much to be happy about in here at all. When you think of the people “running” the health care system, this is them. And they don’t have much to say that’s positive. The phrase “We have met the enemy and he is us” comes to mind. I’m sure that most of these executives don’t see the contradiction in their views and will staunchly defend their positions. Interesting approach. Almost everyone hates hospital execs, yet for this kind of info, it is a good approach. I suspect that they may feel time pressures much more than their counterparts elsewhere. 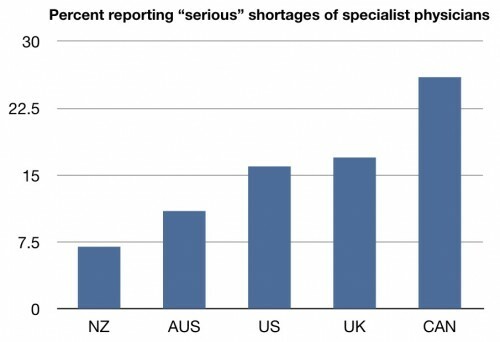 With the US health care just in time system, small shortages in key areas can cost lots of money.